It is impossible in today’s political climate to avoid talking about religion when we talk about violence in the world. The world, clearly, has religious fanatics, specifically connected to radical Islam, who foment terror and violence, and who have killed thousands and caused countless others to be traumatised by their cruel methods of torture and war. Certainly, we cannot ignore radical Islam, nor can we even ignore the larger context of Islam, which these violent, hateful and reckless people exploit to wreak their carnage. Moreover, not only are groups like the ISIS and Al Qaida responsible for human deaths, but, along with the like-minded Taliban, they have also destroyed priceless archaeological sites and world heritage sites because they represented ancient structures of paganism and infidel religious beliefs. Failure to call out the religious aspects of this violence against the world will prevent us from confronting them with the vigour and energy that we need in order to defeat them. Nevertheless, the last 100 years of violent beh­a­viour on a national and world scale, and over the past 50 years or decade will show us this simple a truth: murder and terror happened not in the name of religion or God, but, rather, in the name of either secular ideo­logy, such as Communism, or a political or military ideology and strategy such as the Viet­nam war or nat­ion-building in Iraq and Syria. Violent racism such as Nazism or the Ku Klux Klan only secondarily rests on religious roots. More often than not, racist and nationalist violence is not about religion at all. To the contrary, it ignores basic Western religious ideas of all humans being created by One God from one human being, or even ideals of Eastern religions. Israel today has forces that try to be moderate. Also there are radicals, who are a challenge to the Jewish thought. As a Jew and a rabbi, I am aware of the history of anti-­Semitism, which was an element of Christianity and Islam from almost their inception. A 1,000 years ago, the Crusades were a violent rel­igious movement of mass murder. But in the 20th century, the avowed atheist ideology of Nazism exp­loited und­erlying Christian anti-­Semitic tropes–and tried to use Muslim anti-Semitism typified by Mufti Haj Amin al-Husseini—to kill six million Jews. The other massive world acts of violence were perpetra­ted by Joseph Stalin (ten million civilians), Mao Zedong (tens of millions starved and tortured to death), Pol Pot (three million Cambo­dians), and Rwanda (over a million murdered by ethnic Hutus) just to name a few. Even today, the civil wars in Syria, Libya, Yemen and elsewhere, which have resul­ted in nearly a million deaths and in millions of refugees fleeing violence and threats to their life, were not started by varying bel­iefs in God, or even fuelled by religious passion. If anything, we can blame forces of democracy and a yearning for freedom and to build free nations on the continuing bloodshed. In Syria and in Iraq, some of the fighting and violence is Sunni vs Shiite, the two major and differing streams within Islam. But there is a lot of Sunni-on-Sunni violence, and there are many coalitions that bring together Sunnis and Shias to face common enemies. Hamas is the Palestinian offshoot of the fundamentalist Muslim Brotherhood—fiercely Sunni. Yet, they have allied with Hezbollah which is Shia and with Shia Iran. Turkey, which follows a moderate Hanafite school of Sunni Islam, has allied itself to Iran as well. The Assad family, which has ruled Syria for decades and is also responsible for hundreds of thousands of civ­ilian deaths, is Alawite Muslim: Alawites are a secular, atheist form of Shia Islam—not God-fearing or pious at all. In Leba­non, while there have alw­ays been tensions between the Muslims and the Christians, the violence that occ­urred in the late 1970s and ’80s was mainly national tensions between Palestinians and Falangist Christians. The infamous massacres at the Sabra and Shatilla refugee camps were hardly religiously motivated: they were perpetrated by Christian Falangists against Palestinian refugees. While Israel’s secular defence minister Ariel Sharon tragically did not act to stop the killings, Jewish religious leaders in Israel roundly condemned his passivity and called for an inte­rnal investigation of the massacre. Under the significant influence of the fundamentalist Hezbollah, a highly religious group of people, things have been quite calm for the Lebanese Christian population, even though they present a deathly threat to Israel’s population. Even there, Hezbollah has so far shunned another bloody war against Israel. When it comes to the Arab-Israel conflict, anti-­religious Arab leaders such as late Egyptian president Gamal Nassar (who hanged the fundamentalist writer and thinker Sayyid Qutb in 1966), Syrian statesman Hafez Assad and Iraqi president Saddam Hussein have all been amongst the most vocal and virulent in their desire to destroy the Jewish state. On the other hand, it was an outwardly religious man, Anwar Sadat, who prayed five times a day, who made peace with Israel. Even the Saudis, with all their Wahabi fanaticism, remain moderates in their relations with Israel. As a supporter of a Jewish state, it is critical for me to INS­pect the role of the religion within contemporary Jewish support for the founding in exi­stence of the state of Israel. For thousands of years, since even before the distraction of the second temple in 70 AD, the vast majority of Jewish tradition has been against Jews acti­vely trying to establish a state without the approval of the world. The Balfour declaration of 1917 and the subsequent app­roval of a Jewish homeland by the League of Nations and then by the UN in 1947 changed the picture beca­use the world app­roved of the Jewish cause of est­ablishing a Jewish homeland in ancient Palestine. Nevertheless, the maj­ority of religious Orthodox leaders remained non-Zionist. The leaders of the Jewish resistance organisations that fought the British and defended Arab aggression against the local Jewish community in Palestine before 1948 were not by rabbis and did not seek or get rabbinic approval for any of their specific actions. While Menachem Begin had respect for Jewish tradition and for Rabbis, he acted as a nati­onalist Zionist leader and followed in his father’s footsteps who, in Europe, had been a counter to the religious establishment. The blowing up of the King David Hotel in 1946 (two years before the founding of the State of Israel), which was the headquarters of the British army in Palestine in Jerusalem but housed Jewish and other civ­ilians workers, was a decision that was made not on the basis of religion but on the strategy of a secular guerrilla group Irgun, led by Begin. The other leaders of pre-state paramilitary organisations, the Hagana and the Lehi, were moti­vated by the nati­onalist Zionist movement, and a concern for Jewish survival in pre-Israel Palestine, not by religious impulses. Yet Zionism, through the infl­uence of Abraham Isaac Kook (1865-1935), certainly became accepted and integrated into a Jewish religious outlook by a large part of religious Jewry and the religious leadership over the past 120 years. Therefore, it becomes the responsibility of Jewish rel­igious leadership to make sure that the nationalist and even messianic elements of religious Zionism are tempered by the long tradition of the Jewish reli­gion that calls for peaceful, existence with the non-Jewish world. On the contemporary scene in Israel, one can observe some forces of religion that try to moderate, yet there are certainly pockets where religion—Judaism–serves as a catalyst for radicalising Zionist thought, led most notably in the past by Rav Abraham’s son Tzvi Yehuda Kook (1891-1982). This tension continues to be a challenge for contemporary Jewish thought. Nevertheless, the greatest Zionist rabbinic leaders of the past generation, in Israel and the Diaspora, from Rabbi Joseph Soloveitchik to Rabbi Ovadia Yosef to Rav Ahron Lichtenstein, have all been a force of moderation and accommodation with the non-Jewish world even as they support Zionism. Religion then, even on the difficult terrain of the Holy Land, can and does serve as a voice against violence and aggression. Therefore, it is critical to keep religiously motivated violence in perspective. It certainly exi­sts, and because its adherents speak in the name of God and piety, it seems even more threatening than other types of violence. But in sheer numbers, up to this contemporary time, violence in the name of colonialism, nationalism, racism, idealism and even freedom and democracy (nation-building) has caused far more harm. Nevertheless, we should certainly ask the question: even if religion and belief in God have not directly led to a vast majority of violence we are experiencing in our lifetimes, has religion been significant in moderating violence or in moving otherwise violent people away from perpetrating the horrific crimes against humanity which we have seen over and over again? Shouldn’t we expect people who believe in a benevolent God of love and morality to eit­her stop themselves or stop others from violent behaviour? Protestant, Catholic Churches were intact in Nazi Germany, but those who resisted fascism were persecuted. If we look at the behaviour of the greatest systems of violence in the past century, we can actually see that, yes, religion in modern times would have slowed down or prevented mass killings had the political leaders allowed the religious establishment to exist or exert power. In the case of the Soviet Union, which, again, is responsible for at least million deaths, the Communist authorities fought against the Church and weakened it, if not completely obliterated it. Mao also emasculated the religious leaders and their institutions, which then allo­wed him to murder tens of millions and forcibly dislocate hundreds of millions. The Protestant and Catholic Churches did remain intact in Germany during the Nazi Third Reich, but elements of the Chu­rch that resisted the fascism and racism of the regime were persecuted or eliminated. The Anglican Church in South Africa was a strong voice against the oppression of apartheid, alt­hough, at the same time, there were many leaders of Dutch Church who clearly did not speak out stro­ngly against the racial discrimination and were not the major cause of its downfall. The civil rights movement in America, especially in the African-American community, was Church-based and inspired by reverends and ministers. Organised religion is highly susceptible to the influence of the ideological or political stre­ams in which it finds itself. Many Churches in Germany became willing religious partners to Nazi ideology and, a century earlier, most white Churches in the south of the US were willing religious partners to the racist ideology that justified slavery of Black people. Even in the 20th century, the ultimate symbol of Chris­tianity, the Cross, was burnt in front of homes of Black people all over the South to intimidate them and promote a culture of violence against Blacks. Many in the clergy and many religious people spoke out against the Ku Klux Klan’s violent exploitation of Christianity, but many didn’t. So what we can say is: it is clear that some despots and dictators believed that religion would stop the violence they wished to wreak upon their people. Others knew they would have to seve­rely curtail the power of the Church beca­use otherwise the religious esta­blishment might thwart them in their violent goals. Nevertheless, from slavery in America, to violence against nat­ive peoples in North and South America and Austra­lia, to apar­theid in South Africa, even if there were elements of organised religion that opposed these violent policies and systems, the Church was mostly ineffective in stopping them. Richard Nixon considered himself a Quaker, but the Church that promotes pacifism could not stop him from murdering hundreds of thousands of civilians through the indiscriminate bombings of Laos, Cambodia and North Vietnam. 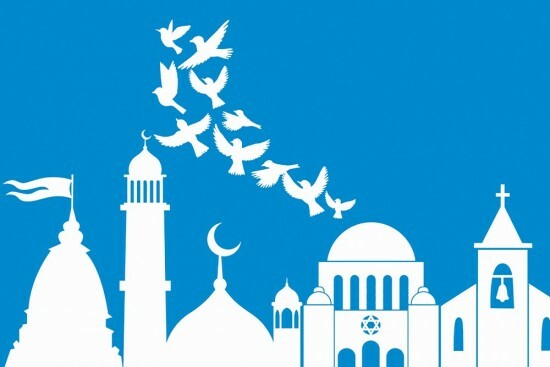 One key element in moving away from violence is a bel­ief that spread from Judaism to Christianity and is a part of Islam, Hinduism as well as many other religions, that the world can and should get better, and ultimately can enter an era of “peace on earth” and love and brotherhood bet­ween all mankind. This underlying belief of so many religions is the opposite of much Greek and Hellenistic thought which taught that the world is a never-­ending cycle or continuum of violence and war. The Jewish idea of a Messiah reflects the Biblical idea of the return of the Jewish people—one day—to their land and all nations coming together to worship God in harmony and a unified cause. With this belief, religion gave hope and confidence to people like Martin Luther King and all those who fought for decades for civil rights in America. It gave hope for those who resi­sted the violence of the Nazis. Even in the Soviet Union, where Judaism was almost completely outlawed, Jewish refuseniks drew optimism from their religion. It enabled them to go on resisting the tota­litarian regime, whether in the Gulag in Siberia or in Moscow in tiny apartments studying Hebrew, the language of the redemption and the Messianic era for Jews. The advent of computers and the internet has led rabbinic authorities to debate a medieval advice against writing god’s name. The bulk of Jewish legal opinion, however, agrees that this applies only when written in Hebrew and not in other languages. This gift of religion, the belief in a vision for a better world, is the ultimate weapon against vio­lence and oppression. It pushes religions to change their attitudes—as we have seen the Catholic church change its view of the Jews to the extent that it can recognise Israel, the Jewish State. Many Protestants have changed their views of “replacement theology” and now can see Jews as also having a covenant with God and also having a fut­ure, as Jews, in the Messia­nic era. President Anwar Sadat, perhaps Egypt’s most successful fighter against the Jewish State, could go to Jerusalem, and sign a peace treaty with Menachem Begin, a man the British had dubbed a terrorist during its Mandate period (1920-48). Religion teaches us not to accept a violent oppressive world or viol­ent, oppressive ideologies: there may be a time of violence, but it is not the ideal and it should not last. While Islam its­elf views parts of the world as “The domain of War”, the ultimate is for those parts to bec­ome the “Domain of Islam”. True, fundamentalist Muslims will interpret that as a war to the end until Islam prevails. Yet the more peaceful streams of Islam will see all these domains and even the “jehad” struggle its­elf as an inner struggle, an inner battle against “war” and in fav­our of the Muslims themselves conquering the warlike eleme­nts within. In this view of change, when Muslims themselves become true to Islam, the world will be ready for peace. I pray that all religions work harder to fight violence and opp­ression, to cling to the Messianic message that this can be a better world, a place of peace. Religion is sometimes slow to stop the warring elem­ents in our societies, but religion also gives us the tools to be the ultimate victors over hatred, violence and oppression.